The debut album by The Mothers Of Invention, Freak Out!, sold a disappointing 30,000 copies when first released in 1966. But it nonetheless garnered enthusiastic critical acclaim (including #243 on the Rolling Stone Top 500 list). Undeterred by an early failure, the band soldiered on, releasing Absolutely Free in May 26, 1967. Led by musical genius Frank Zappa and allowing no known genre of music to remain off the record, The Mothers provided a cacophony of sounds, both instrumental and vocal, with references to works from Stravinsky to the Kingsmen (“Louie Louie”). Absolutely Free is a wacky, psychotic, outside-the-box menagerie of Zappa’s talent for the unexpected, which led to nearly fifty other albums (and 20 posthumous) before his death in 1993. It’s very much worth a listen, and can be purchased as a CD or mp3 downloads at Amazon (but not iTunes). 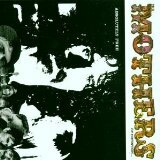 Frank Zappa and The Mothers best tracks are in the Playlist Vault at DrRock.com.